In a perfect world, technicians would lift the house out of the ground, coat the underside of the house with some sort of termite proof material and drop it back down. 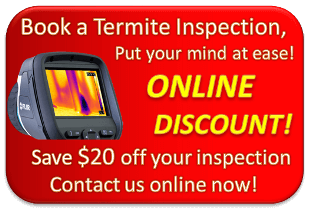 What we are saying is in a perfect world termites would never attack houses. Its relatively easy to design a new house with permanent termite protection, there’s plenty of good methods and systems around. On the other hand, it can sometimes be problematic to retrofit termite protection to an existing house. Here are examples of why that can be the case. 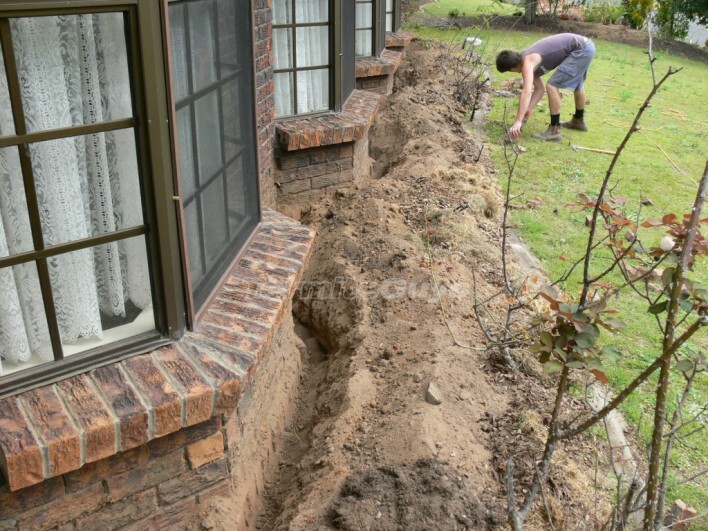 You may also get an idea of why it is best practice to cut the concrete the whole way around your house to expose the footings, even if it is rarely done. MORTAR DAGS – The brick layer or the renderer is in a hurry. Rather than removing the excess mortar or concrete they allow it to run down and dry on the exposed fittings. 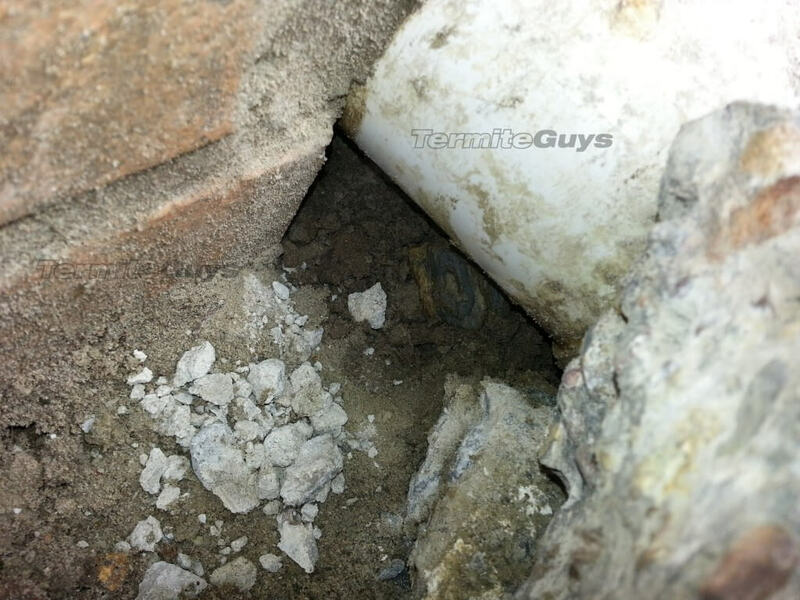 A joint is created between the mortar dags and the footings that can protect a termite entry point. We will make every effort to remove this material, even though it can be really thick. It may remain under concrete paths and other inaccessible areas. In rare cases concrete cutting is required to access and then remove it. MORTOR DAGS CAN CREATE SERIOUS ISSUES IF LEFT NEXT TO YOUR HOUSE. ROOT MATTING – Another great reason to keep large trees, shrubs AND ESPECIALLY PALMS well away from the house. It can be extremely difficult or impossible to remove heavy root matting without heavy machinery or power tools. It shouldnt be there anyway as it can damage brickwork and strangle pipes. Remember that under driveways and concrete paths root matting may exist that could obstruct the flow of chemicals. Cutting the concrete again may be the only option. 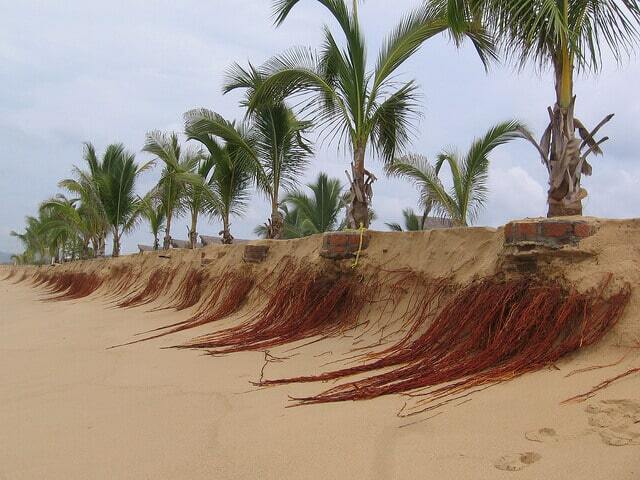 USUALLY CONCEALED UNDER YOUR HOUSE OR DRIVEWAY THE ROOT SYSTEM OF A PALM CAN BECOME A TERMITE HIGHWAY. AIRCONDITIONERS, WATER TANKS, HOT WATER SYSTEMS – All of these are common impediments when they are placed hard up against external walls. The crusher dust pads that tanks are sometimes laid on have no organic material for the chemical to bind to. Standards require is to drill ideally no further than 150mm from the wall, we may have to go way beyond that if you arent willing to go through the ordeal of getting the fixture temporarily disconnected and moved. FOOTINGS – Sometimes the foundations of the house are rough without smooth edges, wandering in and out from the wall like a drunken rambler. This can make drilling problematic if the paths above are laid close or on top of the footings with no gap. We may have to come out further from the wall to find the edge where the chemical is needed. Trenching can get ugly in these situations as we are forced to wander in and out as the footings do. 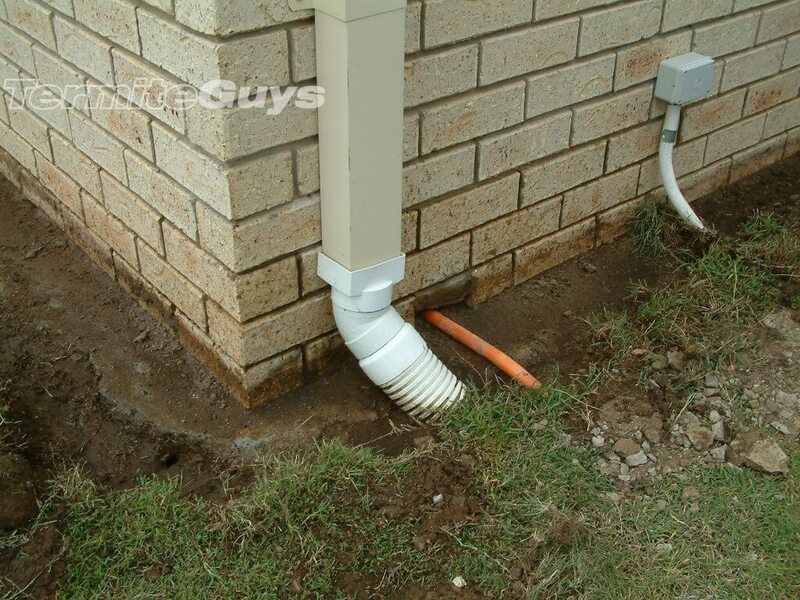 PENETRATIONS AND DRAINS – We desperately want to avoid hitting the water line, gas line, electricity, sewerage or telco line just as much as you do. It is well worth hiring a pipe locator to find these services and avoid a much bigger disaster. We will use common sense to try and avoid obvious risks but we do not have x-ray vision and can’t predict what the previous home owner added. SUBTERRANEAN WALLS – If the footings are 2m down, you’re gonna need a bobcat or another plan. There are may times that we’ve had to think outside of the box and our exemplary record demonstrates our ingenuity. There is no problem that can’t be overcome! Contact our office if you think you’ve got a tough one!